Around a quarter of the UK’s homeowners want to move within the next few years, but many are dissuaded by what they see as high costs and charges. The fees and stamp duties are as much of a deterrent as the rising property prices themselves! Some first-time buyers will be helped by last year’s abolition of stamp duty, but there are savings that even old-timers can make when they take their next step on the property ladder. If you have less to move, you may need just one lorry or a smaller vehicle, so be ruthless. If you haven’t even looked at or inside that corner cabinet for the best part of a year, then it – and its contents – can probably go. By using a reliable and honest estate agent, you’ll have a good idea of how much you’ll be paying beforehand. There’ll be no nasty surprises and you might be able to knock a few pounds off here and there if you’ve built up a good relationship. Most people want to move at the weekend or during a holiday period, but if you make your move during the week and during term time then it’ll be cheaper. Removal companies will want the business and might even give you a discount. Don’t just load up the first van that takes your fancy! Do some research first; most estate agents will have a preferred company that they send business onto and chances are this referral will get you a discounted rate. Failing that, ask friends and family for their opinions. 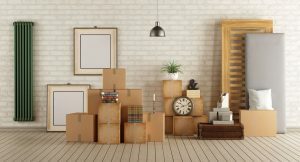 You need to let your internet, phone, TV, gas and electricity providers know that you’re going and when your moving day is so that you’re not paying two lots of bills at once. Sort out your broadband first so that you have the most seamless transition as possible. Will all of your furniture and appliances fit in your new home and will they suit it? If there’s a few items that just won’t make the leap, then sell them before you go so you don’t have to move them and you raise some cash.